- Elevator - The elevator is not available for guest use unless it is needed by an elderly or handicapped person. Please contact 360 Blue to arrange before arrival. LOCATION: This home is beachfront. DETAILS: 104 S Watch Tower is a remarkable three story vacation haven in WaterSound featuring 6 bedrooms, 8 bathrooms and impeccable furnishings. When you're not at the beach, relax and enjoy the private pool. As you make your way through the entrance you are greeted with fabulous décor and impeccable furnishings that continue throughout the entire home. The first floor features a master bedroom, two guest bedrooms. Upstairs is comprised of the fabulous, spacious living and dining area that leads out to a furnished balcony overlooking the towering sand dunes and dazzling waters of the gulf. The state of the art, gourmet kitchen is equipped with anything and everything you need including a gas stove, spacious granite counter tops and a wine cooler. On the opposite end of the second floor is a guest bedroom, complete with queen bed and private bathroom. 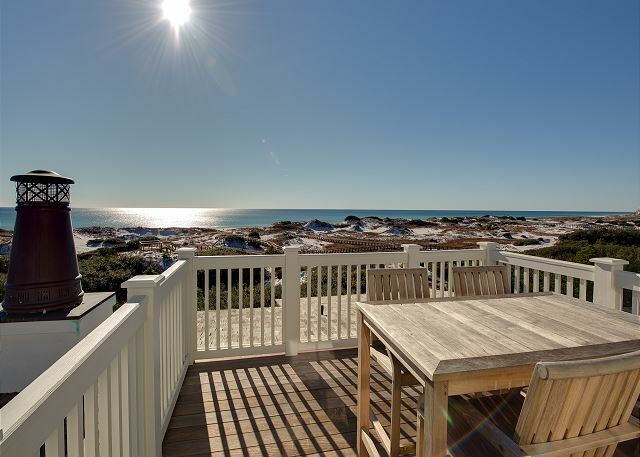 The third floor features two additional bedrooms and beautiful views of the rolling sand dunes from the balconies. With immaculate accommodations for up to 14 guests, this luxury is an ideal location for groups and families. *Please note, there is construction in the vicinity of this home. *Please note, in accordance with the Walton County Ordinance, all doors leading to private pools require a door alarm which is set off when door is ajar. Alarm must be manually disarmed upon exit.